Wind tunnels are designed for a specific purpose and speed range. Therefore, there are many different types of wind tunnels and several different ways to classify wind tunnels. In this section of the website we shall present various types of wind tunnels and discuss some of the unique features of each type of tunnel. 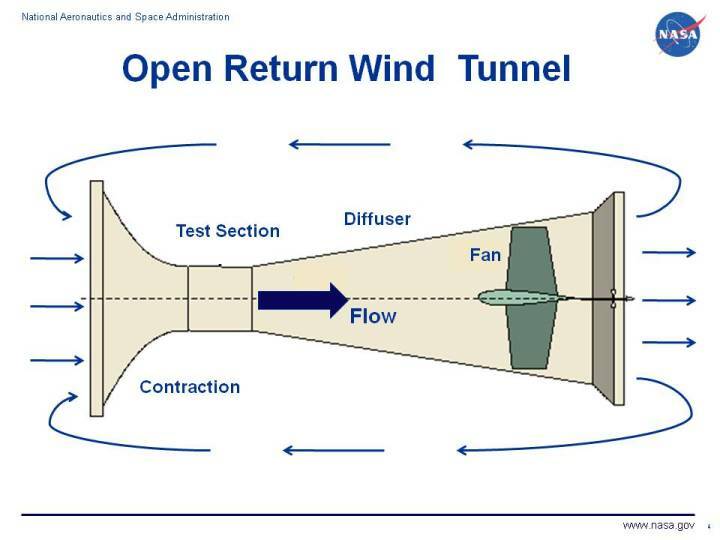 On the figure, we show a schematic drawing of an open return wind tunnel. This type of tunnnel is also called an Eiffel tunnel, after the French engineer, or an NPL tunnel , after the National Physical Laboratory in England, where the tunnel was first used. The Eiffel tunnel has an open test section, while the NPL tunnel has a closed test section as shown in the figure. The original Wright Brother's wind tunnel was an open return design. In the open return tunnel, the air that passes through the test section is gathered from the room in which the tunnel is located. The arrows on the figure denote the flow of air through the wind tunnel and around the room. The other major type of wind tunnel is the closed return tunnel, in which the air is conducted from the exit of the fan to the contraction section by a series of ducts and turning vanes. The open return tunnel has some advantages and some disadvantages relative to the closed return tunnel. Superior design for propulsion and smoke visualization. There is no accumulation of exhaust products in an open tunnel. Poor flow quality possible in the test section. Flow turning the corner into the bellmouth may require extensive screens or flow straighteners. The tunnel should also be kept away from objects in the room (walls, desks, people ...)that produce asymmetries to the bellmouth. Tunnels open to the atmosphere are also affected by winds and weather. High operating costs. The fan must continually accelerate flow through the tunnel. Noisy operation. Loud noise from the fan may limit times of operation. An interactive Java applet which allows the user to change the geometry and flow conditions in an open return wind tunnel is presented here. The following portions of the page describe how to work the applet.